About 100 people gathered on the steps of the courthouse in downtown Vancouver Friday to show support for the Tŝilhqot’in Nation in its fight to save Fish Lake from the new version of the Prosperity Mine project. “What I call it is genocide. You know with our history that’s what happened and today is no different – the genocide is still here,” said Chief Francis Leceese of the Tl’esqox First Nation when he addressed the gathering. 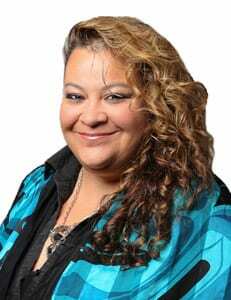 The Tsilhqot’in Nation is against a new plan by Taseko Mines to begin drilling around Fish Lake, known as Teztan Biny. Taseko’s proposed New Prosperity Mine was approved for development by the provincial government in 2010 and received a drilling permit in 2017 to collect geotechnical information. The federal government had twice rejected the mine. Chief Jimmy Lulua says the land must remain untouched. At Friday’s court hearing, a high-profile supporter showed up to support the nation. 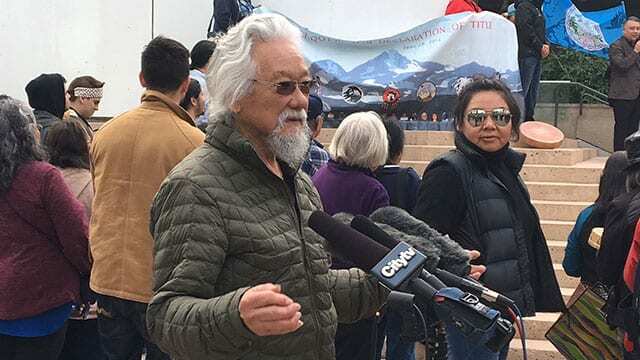 “It may seem like a remote battle going on somewhere else but environmentalism teaches us everything is connected so what they are fighting for in terms of their sacred land is a fight for us as well because from those waters come many of the salmon that feed the whales here in the Salish Sea, it’s all interconnected,” David Suzuki told the gathering. The company initially wanted to turn Fish Lake into a tailings pond. But in July 2010, a federal review panel found the project would have significant adverse environmental effects on the land and water. For the Tŝilhqot’in people it’s a sacred place with ancient burial grounds and an abundance of fish. For Taseko – it’s the seventh largest deposit of gold and copper in the world. In 2011 the project was renamed the New Prosperity Mine. The new proposal didn’t involve draining fish lake – however the Tŝilhqot’in Nation continued to oppose the project. Three years later in 2014, the Tŝilhqot’in won a landmark land rights case in the Supreme Court of Canada – which put the project on hold once again. But in July 2017, on former B.C. Liberal premier Christy Clark’s last day in office – she approved permits for the company to begin exploratory work in the area. According to Chief Jimmy Lulua of the Xeni Gwetin First Nation, they haven’t ramped up yet. “They are exploring I don’t think any drilling going on but they have been given their go – ahead on the 19th but I’m pretty sure they are just opening roads and doing whatever else but nothing too drastic yet,” he said.